Paul was born on the Rosebud Sioux Indian Reservation in 1947. He is of Hungarian, Polish, French and American Indian descent and is an enrolled member of the Rosebud Sioux Tribe. He attended Todd County High School in Mission, South Dakota and went to college at Dakota State University, Madison, SD where he earned a BSE degree with a major in history and a minor in art. He taught social studies, art and photography for 10 years on and around the Rosebud Reservation. Paul has been a silversmith on a part-time basis since 1976. He resigned his teaching position in 1991 to dedicate himself full-time to this art. 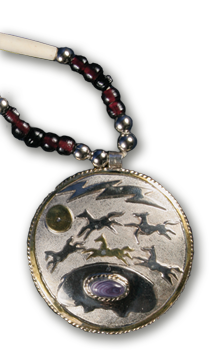 The accomplishments, deeds, beliefs and spirituality of an individual Lakota were expressed through adornment of their personal belongings and themselves, utilizing natural and supernatural images. Through the development of his own artistic style, Paul Szabo expresses Lakota culture and religion with unique symbolism which appeals to all people, not just Native Americans. Although the designs come from the Northern Plains cultures, the Zuni and Hopi metal smiths have influenced his technique. Szabo's work is available through the Akta Lakota Museum online gallery.